Eyes are filled with fluid. This means they are the perfect organ for ultrasound assessment in the emergency department. Q1. In which 5 settings or emergency presentations should you consider using ocular ultrasound? Q2. Describe how ocular sonography is performed. Use a high-resolution (e.g. 7.5 MHz or higher) linear array ultrasound transducer. apply a large amount of standard water-soluble ultrasound transmission gel to the patient’s closed eyelid so that the transducer doesn’t actually need to touch the eyelid. adjust ‘DFG’ — adjust depth so that the image of the eye fills the screen, adjust the focus as required and turn up the gain to achieve acceptable imaging (to assess the vitreous chamber the eye should be examined at both ‘moderate’ and ‘high’ gain settings). Scan both eyes in both the sagittal and transverse planes through closed eyelids. Nice work, you’ve just performed an ocular ultrasound! Q3. What does the image show? Describe the features. This is a normal eye! cornea — thin hypoechoic layer parallel to the eyelid. anterior chamber — filled with anechoic fluid and is bordered by the cornea, iris and anterior reflection of the lens capsule. 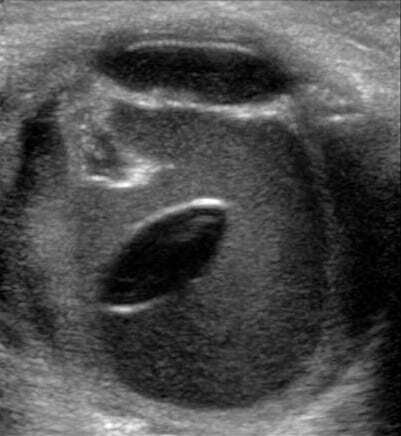 iris and ciliary body — echogenic linear structures extending from the peripheral globe towards lens. Pupillary response can be assessed by shining a light in the fellow eye. vitreous chamber — filled with anechoic fluid in the young healthy eye. retina — cannot be differentiated from the other choroidal layers. retrobulbar area includes optic nerve, extraocular muscles and bony orbit — the optic nerve is visible posteriorly as a hypoechoic linear region radiating away from globe. Doppler can be used to assess the central retinal artery. Q4. What traumatic eye injuries may be diagnosed using ultrasound? Q5. What are the ultrasound findings of globe rupture? Q6. What are the ultrasound findings of a dislocated lens? the lens is displaced from its normal position, either anteriorly or posteriorly. this may be a result of trauma or occur in conditions like Marfan’s syndrome. other evidence of trauma, such as vitreous hemorrhage, globe rupture or retinal detachment may also be present. Q7. What are the ultrasound findings of an intraocular foreign body? Q8. What are the ultrasound findings of retinal detachment? in total retinal detachments the folded surface attaches to the ora serrata anteriorly and the optic nerve posteriorly. Q9. How can raised intracranial pressure be detected using ultrasound? Optic nerve sheath diameter (ONSD) correlates closely with ICP and can be measured using ocular ultrasound. The normal optic nerve sheath is up to 5 mm in diameter. ONSD is higher in the presence of a raised ICP (>20 mmHg). Moretti et al (2009): ONSD threshold of 5.2 mm as a predictor of ICP >20 mm Hg had sensitivity and specificity of 94% and 76%, respectively. Q10. What are the ultrasound features of posterior vitreous detachment? Fine linear and granular appearing echodensities visible in the vitreous chamber when gain settings are ‘very high’. 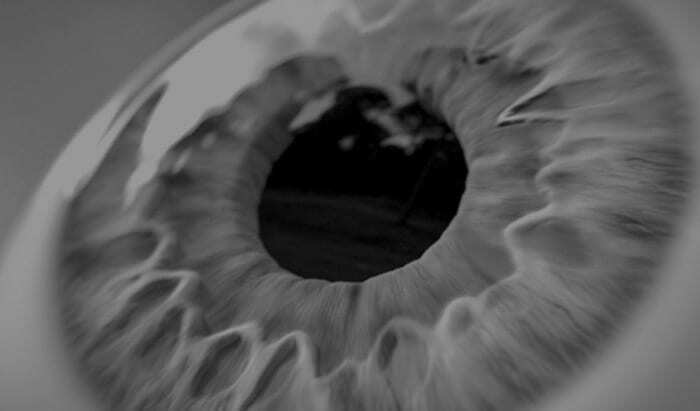 There is a swirling appearance when the patient moves his or her eyes. occurs in front of the optic disc and does not remained anchored to it. lacks a thickened hyperechogenic membrane. Q11. what are the ultrasound features of vitreous hemorrhage? Ultrasound can also detect a hyphaema in eye trauma when the eyelids cannot be opened. Babineau MR, Sanchez LD. Ophthalmologic procedures in the emergency department. Emerg Med Clin North Am. 2008 Feb;26(1):17-34, v-vi. PMID: 18249255. Blaivas M, Theodoro D, Sierzenski PR. A study of bedside ocular ultrasonography in the emergency department. Acad Emerg Med. 2002 Aug;9(8):791-9. PMID: 12153883. Kimberly HH, Shah S, Marill K, Noble V. Correlation of optic nerve sheath diameter with direct measurement of intracranial pressure. Acad Emerg Med. 2008 Feb;15(2):201-4. PubMed PMID: 18275454. Liu Y, Chen J. Focused bedside ocular ultrasound. Acad Emerg Med. 2008 Aug;15(8):792. PMID: 18783493. Major R, al-Salim W. Towards evidence based emergency medicine: best BETs from the Manchester Royal Infirmary. BET 3. Ultrasound of optic nerve sheath to evaluate intracranial pressure. Emerg Med J. 2008 Nov;25(11):766-7. PMID: 18955621. McIlrath ST, Blaivas M, Lyon M. Diagnosis of periorbital gas on ocular ultrasound after facial trauma. Am J Emerg Med. 2005 Jul;23(4):517-20. PMID: 16032623. Moretti R, Pizzi B. Optic nerve ultrasound for detection of intracranial hypertension in intracranial hemorrhage patients: confirmation of previous findings in a different patient population. J Neurosurg Anesthesiol. 2009 Jan;21(1):16-20. PubMed PMID: 19098619. Rajajee V, Vanaman M, Fletcher JJ, Jacobs TL. Optic nerve ultrasound for the detection of raised intracranial pressure. Neurocrit Care. 2011 Dec;15(3):506-15. PubMed PMID: 21769456. Sawyer MN. Ultrasound imaging of penetrating ocular trauma. J Emerg Med. 2009 Feb;36(2):181-2. Epub 2007 Aug 29. PMID: 17976814. 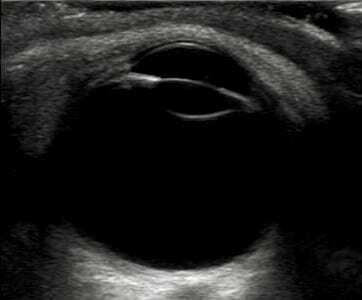 Shinar Z, Chan L, Orlinsky M. Use of Ocular Ultrasound for the Evaluation of Retinal Detachment. J Emerg Med. 2009 Jul 20. [Epub ahead of print] PMID: 19625159. Tayal VS, Neulander M, Norton HJ, Foster T, Saunders T, Blaivas M. Emergency department sonographic measurement of optic nerve sheath diameter to detect findings of increased intracranial pressure in adult head injury patients. Ann Emerg Med. 2007 Apr;49(4):508-14. Epub 2006 Sep 25. PMID: 16997419.